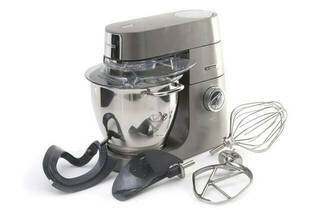 Snapshot: The Kenwood Chef XL Titanium KVL8300S has a 6.7L bowl and comes with a whisk and a scraper beater. How well does it beat, knead and mix? Fairly comprehensive instructions with separate cookbook. Bowl has two 'D' shaped handles for easy grip. Pouring shield supplied clips onto motor head and stops splashing when adding ingredients. Tall narrow mixing bowl requires extra effort to scrape out bowl. Mixer head jolts when mixing a heavy load. Mixing bowl is large and may not fit comfortably in a domestic sink. Unit can jolt when mixing a heavy load.